The right side of the Pebbles boulder abuts another rock, forming a small dihedral. From a sit start (optional) climb the face and crack to the left of the without using the rock that forms the right side of the dihedral. Top out directly above near the stump of the tree mentioned in Greene and Russo's guide. 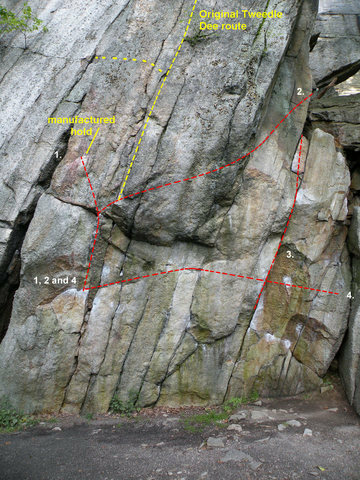 This route gets V3 in the Greene and Russo guide, but is measurably easier than any of the other V3s and several of the V2s on the Pebbles boulders. Also see Rich Goldstone's comments under the photo. On the right side of the right Pebbles boulder. The Right Pebbles Boulder: 1. [[Tweedledee]]106514336 2. Flight of the Gumb (V6) 3. [] (V2) 4. Lynn Hill's Traverse (V8) The line on the Beta Photo should probably be further right. The all the holds on the face to the right of the crack are in.